Unlike the Marblehead-Halifax race where tidal currents play a key role, racing to Bermuda is hardly affected by tides but is significantly affected by the Gulf Stream. 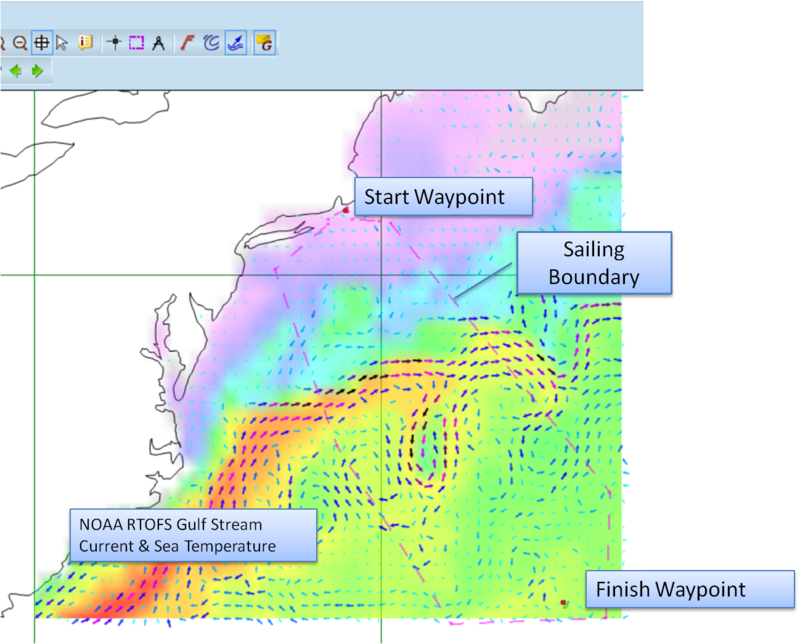 Having good knowledge of the Gulf Stream at the beginning of the race allows the navigator to formulate a strategy for crossing the stream and taking advantage of favorable current eddies and meanders. Luckily the stream does not change rapidly so one can usually do well if you are unable to get updated stream information during a race. However obtaining wind forecast updates during the race can be crucial for success. With a sat phone connection SailFast can easily download Gulf Stream and wind/weather grib file forecasts. These grib files are freely available from Saildocs and should therefore comply with the racing rules. There are a number of free and commercial sources for Gulf Stream information. Good starting points for information are Newport-Bermuda Gulf Stream and Weather page and Marion-Bermuda Gulf Stream and Weather page. 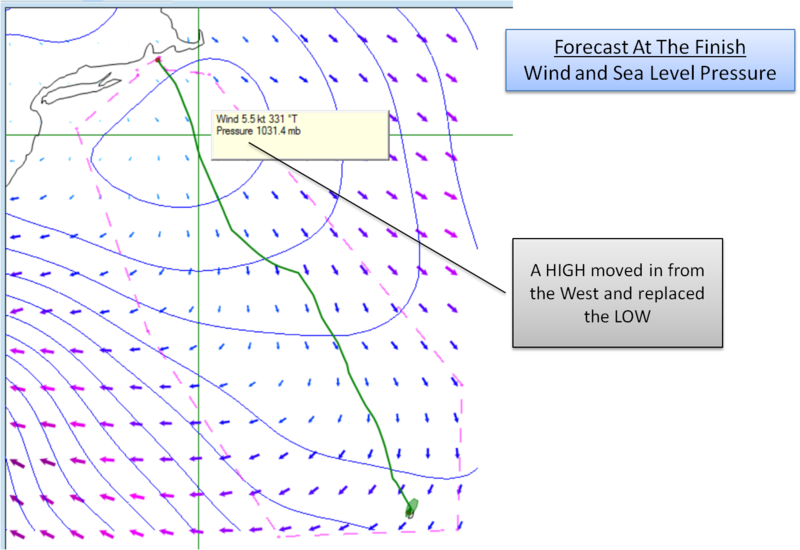 SailFast™ accepts grib current forecasts in addition to predicted wind. The NOAA RTOFS (real time ocean forecasting system) grib includes detailed current and sea temperature data. Forecasts in 12 hour intervals out to 5 days are available. SailFast includes a tool for easily specifying and getting gribs from Saildocs and eliminates having to deal with the Saildocs request syntax. In some cases you may want to manually make grib requests to Saildocs by email, and SailFast supports that method also. Here is a useful tutorial article by Gram Schweikert. Let's look at a SailFast example. Below is a screen shot showing some of the set up details prior to performing an optimum route analysis. A starting waypoint off Buzzards Bay has been set as well as a finish waypoint off of Bermuda. A NOAA RTOFS grib file has been downloaded. 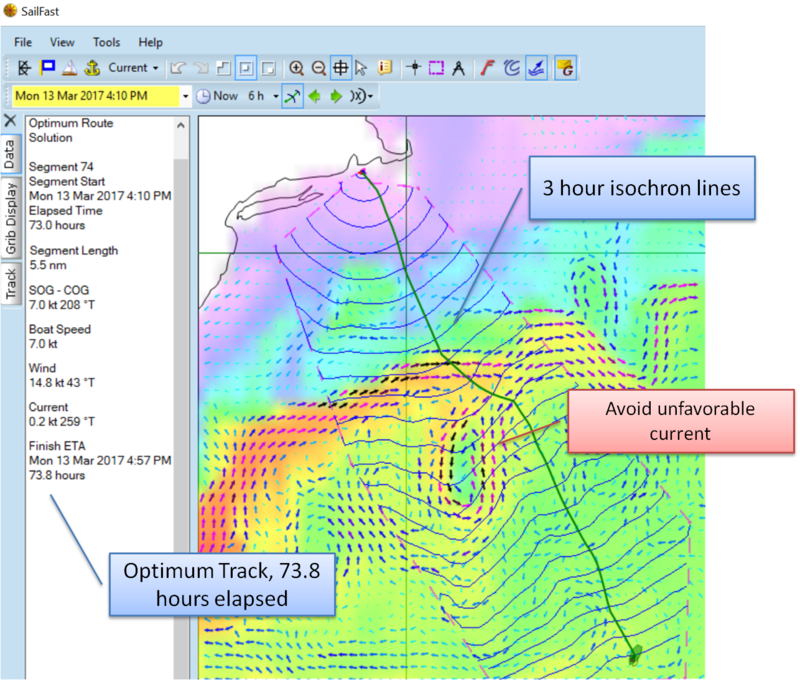 The colored gradient background depicts sea temperature and the arrows show current direction. The color and size of the arrows also indicates current magnitude. When the cursor is placed over the chart SailFast will display the numeric value of the grib parameters. In this case sea temp in degrees and current direction and speed. The dashed magenta boundary lines are placed by the navigator. Routing solutions are kept within the boundary. One use of the boundary is to prevent sailing over land or hazardous areas. The optimum route solution (green line) is shown below. The blue lines are the isochrons. A given line represents the locus of possible points farthest from the start that a boat could reach at a certain time. These isochrons are for 3 hour increments from the start. Notice the large Gulf Stream meander in the middle of the course. Current on the West side of the meander is favorable while the East side is not. Observe how the isochrons along the meander's West side bulge Southward showing the extra speed and distance resulting from the current. SailFast has determined that the fastest route is East of the meander. The data on the left of the chart shows details for each segment of the route. The total sailing time is 73.8 hours. Next let's do a simple what-if analysis to better understand why the fastest route is not West of the meander. Here we have inserted another boundary line that is blocking the route on the East side. We have disabled the view of the current arrows to reduce the clutter, but we can tell where the meander is from the sea temp gradient color. The new route to the West side finishes in 76.2 hours. Slower than the optimum by 2.4 hours. The speed boost doesn't make up for the greater distance sailed. So far we have focused on the Gulf Stream because it is a unique aspect of sailing to Bermuda. However what the wind is doing over the sailing area and the duration of the race is usually even more important to understand and get right. 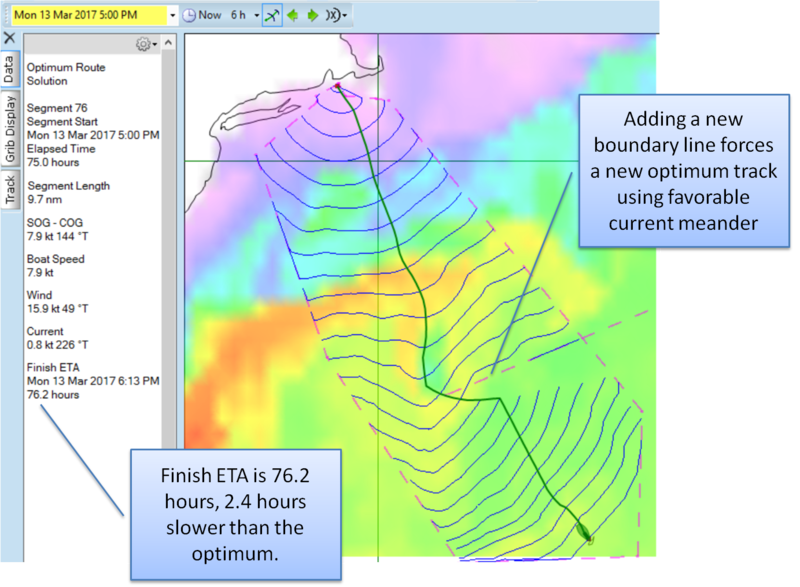 For optimum routing SailFast uses the current, wind and the boat's speed performance as given by the boat's polars to determine the fastest route. To complete our picture look at the wind at the start of the race. There is a low pressure area on the rhumb line which is moving Eastward. 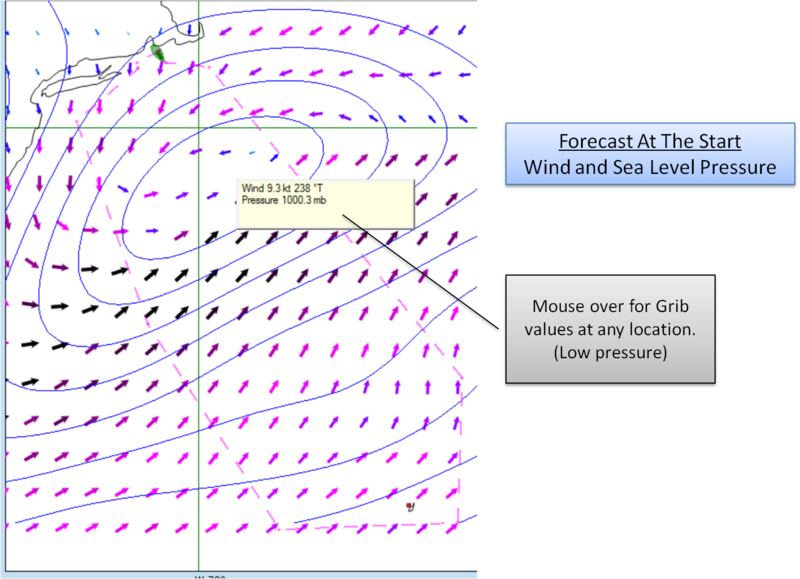 We can easily analyze the grib forecast and note how fast the low is moving. Note the green boat at the start. It is on the first 1 hour segment of the optimum route. If we jump ahead to the finish we see that the wind has changed significantly and is now much lighter. The low has been replaced by a high pressure region.